I love sharing what my favorites are not only to keep track of past look's I have liked, but also to show you readers! This month's favorites is really all about skirts. 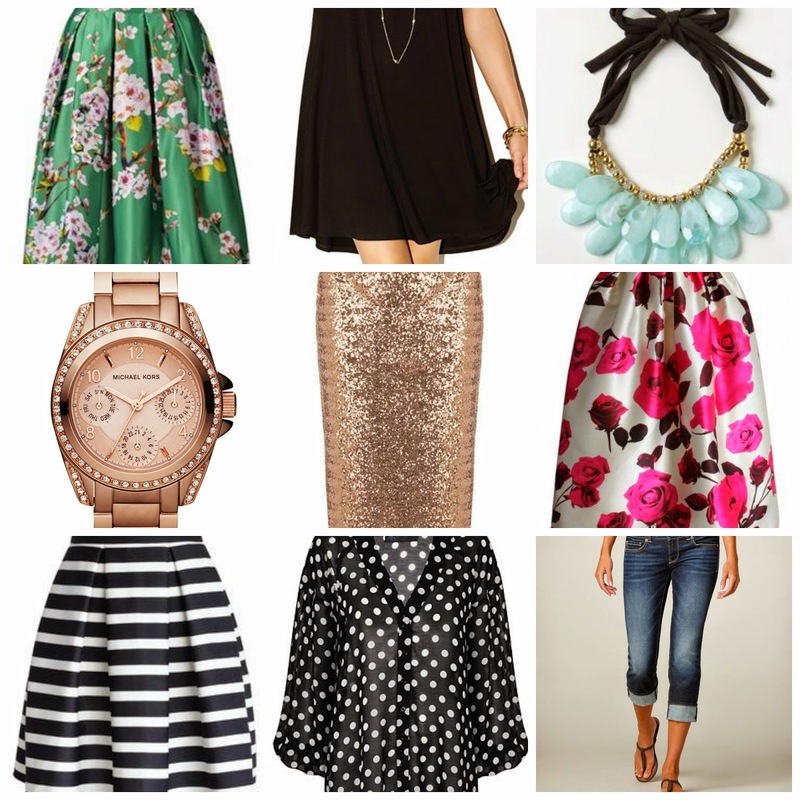 Even though there are other items besides skirts in this post, they are something that I have been loving! For anyone who knows me my day-2-day wear in the summer is a skirt with a cute top or a dress. Not kidding last year I had 49 dresses..they should make another movie about that. I love dresses! There simply to wear, comfy, and you can dress it up casual or dressy! So here are my latest favorite prints for spring/summer! You can never go wrong with a floral skirt, I love the black and white striped skirt, Its making a come back that's for sure! I also love a good sequin skirt. I have lately loved everything glitter and sparkle and love that they are starting to make more variety of sequin clothing items! Then I got the cute Michael kors watch which is a must have!! I love the rose gold, I love wearing it with everyday, it matches with everything! Then I chose a lose dress. They are more relaxed and don't hug to too much of you, which is great! I love that if you pair it with a pair of sandals and a few bracelets and even add a necklace, you will look very cute! Maybe its Spring and it's telling me that all I need to wear is print's but I have lately noticed myself getting more and more articles of clothing that have print's on them. Take for an example the polka dot shirt..just ordered that! To me this is what I would wear with those capri jeans below; on a beautiful spring day! Clothing is truly a work of art that we get to wear! Glad I could share my favorites with you, let me know if you have any questions, also follow, comment, and follow me on my social media sites!